Imogen's Typewriter. 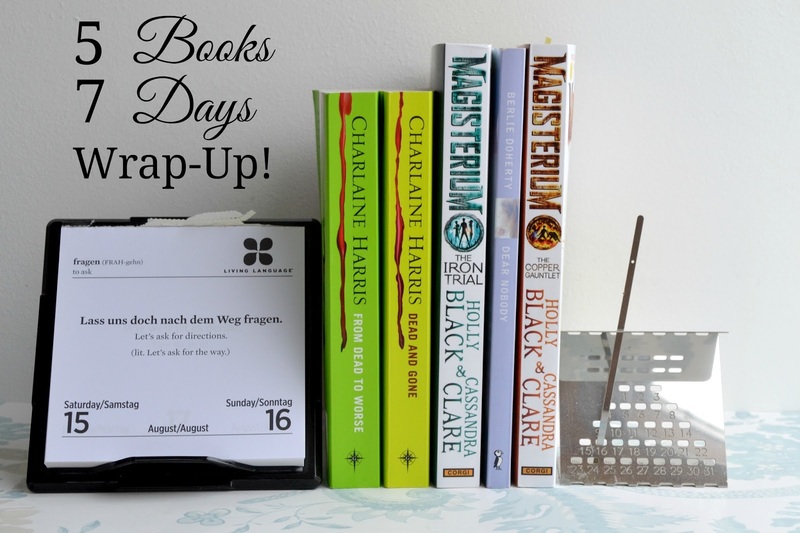 : My #5Books7Days Readathon Wrap-Up! The #5Books7Days readathon ended at midnight on Sunday and I kept reading right up to the bitter end. I didn't make it to five books, not helped by my trip down to London at the beginning and then over to Wales at the end. It's been a busy 7 days! I had a TBR and stuck to it at the beginning... Things changed. After finishing of the last 100 pages of my pre-readathon read; From Dead to Worse I picked up Dead and Gone by Charlaine Harris. As expected I flew through this on the train back from London and enjoyed it! Sookie is a good way to start a readathon. But I decided to switch over to a book I've been sent for review next. So I picked up was Magisterium: The Iron Trial by Holly Black and Cassandra Clare*. I was blown away by this one and my full review will be going up soon. I was so stoked about the series I went on to start Magisterium: The Copper Gauntlet by Holly Black and Cassandra Clare *. But 88 pages in I decided to stop until I've finished my review of The Iron Trial so I don't get confused. Then I had a bit of a look through of my books for something shorter, and found the 150 page Dear Nobody by Berlie Doherty that I started waaaaay back when I was about 12 and never finished. So I started at the beginning and read to the end. It was- okay? Worth reading once but I don't think I'll ever read it again. So three full books, one end and one beginning! Not too shabby. What did you read?